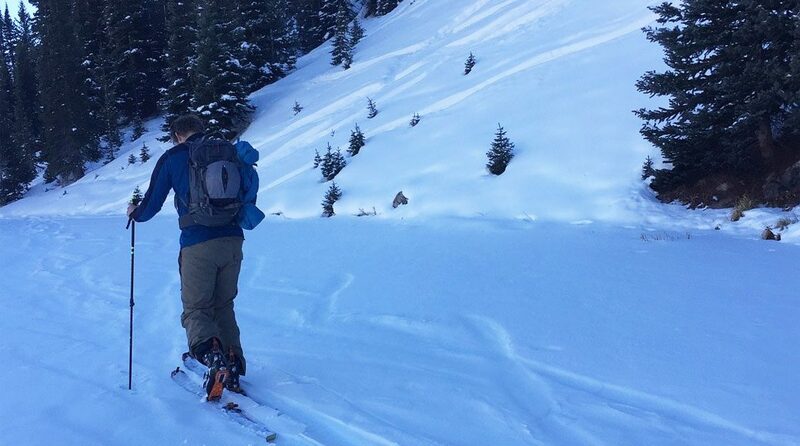 There’s a ‘shift’ to ski touring (free touring), and it’s growing in popularity! So if you’re skiing frontside on the resort pistes or finding that un-tracked snow on the backside of the mountain, the Atomic Hawx Ultra XTD is the perfect all round boot. It’s comfortable, lightweight and gives you the performance you want. 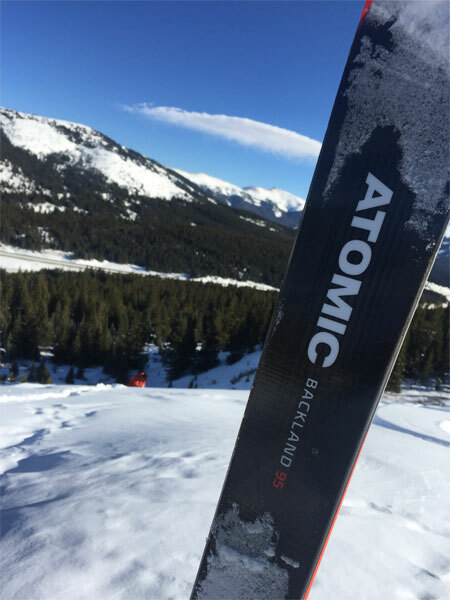 The same can be said of the Atomic Backland skis, lightweight and performance! Before I left for Colorado; I was impressed with the customisation of the boot. The Hawx Ultra has a narrow last, and my foot is defiantly not narrow. However, thanks to the expert fitting of the Memory Fit 3D Platinum Light Liner, these are the comfiest boots I had ever worn; and light! They only weigh 1420g (size 26.5 boot). The lace up liners are a great addition because you can put the linear on before putting the boot on; which is a great help in the cold car parks of the Colorado Rockies. New to the touring scene I was interested to see how I would get on with the pin bindings compared to a traditional alpine bindings. Safe to say any doubts I had were quickly put to bed. The pre-cut skins were also an easy fit (and removal), thanks to a new tip fitting. The carbon backbone of the ski gives it the stiffness and performance you want making those powder turns! My guide (brother) had been up in the mountains for a month skiing and touring every day; so I was expecting to be absolutely beasted when we pulled off the highway at Shrine Pass, Vail (3380M). The extreme light weight of the Hawx Ultra XTD and the Backland 95 skis (1370g size 177cm ski) meant, that although I was behind, my pride was still intact – which is always key when trying to keep up with your brother. After two hours of going up my legs were feeling surprisingly better than I first expected; mostly due to the boots and skis rather than my superior fitness levels. The hike mode on the Hawx Ultra allows the boot to articulate further than my legs possibly can. After an avalanche check it was time to charge down the untracked snow on the Atomic Backland 95 skis that took me uphill so well. They were just as good on the downhill. The carbon backbone of the ski gives it the stiffness and performance you want making those powder turns! The best part about this set up is that it gives you uncharted access. Find yourself a touring buddy and go wherever the snow takes you. For me personally there isn’t much better than being out in the mountains with just yourself and your touring buddy; away from all the noise and lift ques in resort. The next day, with somewhat tired legs, we took the lifts to ski frontside. This is where I had my doubts about pin bindings. Skiing in America for the first time, it was my first experience of someone pulling my skis out of the gondola for me. I was met by an American guy who was extremely excited about how light my skis and bindings were. First run down and all those doubts about the bindings and skis were gone; putting in harder carving turns each time. The pin binding work just as well on piste; and it was noticeable how many people were skiing on pin bindings! The next wave of skiing is defiantly coming in quick, so keep an eye out for our freetouring gear!